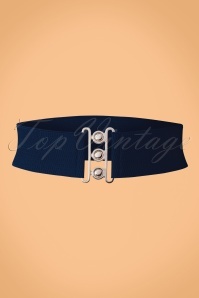 Put a bow on your perfect vintage outfit with this 50s Bow Collar in Navy. Made of a striped fabric in navy blue and white with the looks of satin and featuring a large bow. She is a perfect fit thanks to the adjustable strap and will transform the look of that boring white blouse instantly. Bow down for this bow! Ce nœud est très mignon et très agréable à porter. Il rajoute un petit coté élégant à une tenue ! Look exactly like the pictures .